The Centro de Estudios de Almejas Muertas (C.E.A.M.) [English translation: Center for the Study of Dead Clams] is an informal organization dedicated to the study of taphonomy. Taphonomy is the study of dead things and how they get incorporated into the fossil record. C.E.A.M. is based at the Department of Geosciences, University of Arizona and its members are united by their interest in dead things - clams, insects, brachiopods, vertebrates, plants, etc. Karl Flessa is "El Jefe" and his CV can be found here. Since its founding in 1992, C.E.A.M. 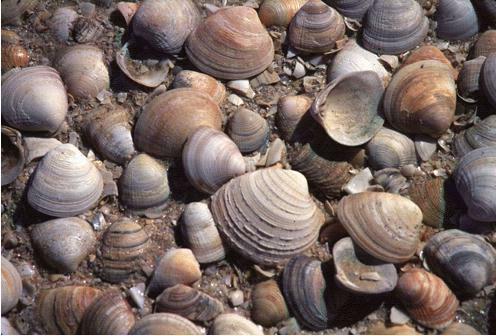 has expanded its scope to include the North Sea, Recent and fossil lingulid brachiopods, the playas and packrat middens of the American Southwest, Tertiary lakes of the western U.S., the Phanerozoic record of fossil communities, the Permian and Devonian marine benthic assemblages of the Parana Basin of Brazil, sclerochronology and and stable isotopes in hard parts..